Great Plains Native Americans lived here. The Great Plains Native Americans lived in the Great Plains. This was made up of grasslands, valleys, streams, and hills. There were very few trees found in the Great Plains area. The picture is an example of the land from the Great Plains. Plains Indians lived in teepees made of buffalo skin and poles made of wood. These teepees were warm in the winter and cool in the summer. The door to the teepee was round. It faced east toward the rising sun. 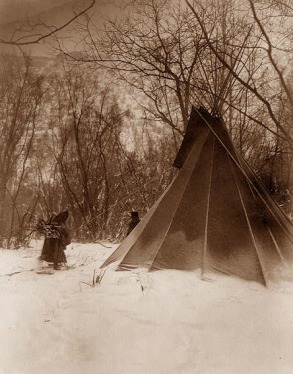 In the middle of the teepee, a small fire was built for cooking and warmth. Plains Indians usually slept on buffalo robes on the teepee's floor. The Plains Indians thought their teepees were very important so they would paint them. These paintings were often symbols of their religion. The women were responsible for putting up and taking down the teepees. The Indians moved their teepees from place to place using horses. These tribes were called nomads. Some tribes did not move from place to place, so these Indians lived in earth or grass lodges. These lodges were dome-shaped and covered with earth (like the one below).